U.S. may be one of the richest countries in the world, with one of the highest per capita gross domestic products among major nations, but Americans are fairly pessimistic about economic prospects for their country’s children. Just 37% of Americans believe that today’s children will grow up to be better off financially than their parents. Such sentiment is relatively unchanged from 2015. Americans ages 18 to 29 are significantly more optimistic than Americans over age 50. But even 49% of 18- to 29-year-olds still hold the view that the next generation will be worse off. Americans ages 50 and older are particularly downbeat: Just 32% say children will be better off, and 61% think they will be worse off. As in their views about the current state of the economy, Americans are divided along party lines when thinking about the financial future for today’s children. Republicans are split about the next generation’s financial prospects, with 45% saying today’s children will be better off and 50% saying they’ll be worse off. Democrats and independents are more pessimistic: Only about a third of Democrats (33%) and independents (36%) say they think today’s children will be better off financially than their parents. In Canada, people are even glummer about the future. Just 24% believe children will be better off financially, a number that is largely unchanged from 2015. As in the U.S., 18- to 29-year-olds (32%) are more optimistic about prospects for the next generation than are people 50 and older (20%). And Liberal Party adherents (33%) are roughly twice as likely as both Conservative Party (17%) and NDP backers (16%) to expect today’s children to be better off than their parents. While their views of current economic conditions may be improving, Europeans remain fairly downbeat about their children’s economic futures. A median of only 30% in Europe believe that when children in their country grow up they will be better off financially than their parents. The most optimistic are the Poles, 48% of whom think today’s children will be better off. Such confidence is up 14 points since 2015. Swedes (44%) and Hungarians (41%) are also somewhat hopeful. The most pessimistic are the French: Only 9% see today’s children doing better than their parents. Like their American and Canadian peers, French, German, Spanish, Swedish and British young adults are more likely than older people to believe today’s children will do better financially than their parents. However, younger adults in France and Spain are still pessimistic overall: Only 15% of French 18- to 29-year-olds and 29% of Spanish 18- to 29-year-olds think today’s children will be better off than their parents, compared with 63% of Swedish young adults and 53% of German young adults. By more than two-to-one (52% better off, 24% worse off) Russians believe that today’s children will be better off. A majority of Russian young adults (56%) are optimistic. Among the Asian-Pacific nations surveyed, two very distinct views about the youngest generation’s financial future emerged. 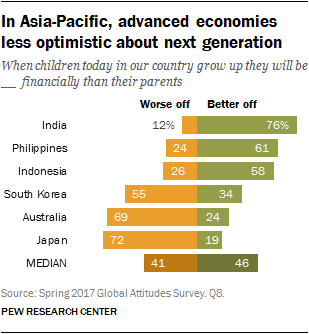 Majorities of Indians, Filipinos and Indonesians believe that when today’s children grow up they will be better off than their parents. But majorities of South Koreans, Australians and Japanese think today’s kids will be worse off. In India, the public is particularly upbeat: 76% see a bright future for Indian children. Roughly six-in-ten in the Philippines (61%) and Indonesia (58%) agree. Filipinos ages 30 to 49 (65%) are more optimistic than their older compatriots. In sharp contrast, roughly seven-in-ten Japanese (72%) and Australians (69%) believe that when today’s children in their country grow up they will be worse off financially than their parents. Japanese and South Korean women are particularly worried about kids’ financial futures. Roughly seven-in-ten in Nigeria (72%) and six-in-ten in Ghana (63%) voice the view that today’s children have bright financial prospects. Younger Ghanaians are particularly optimistic, as are Nigerian women. More than half of Senegalese (54%) are optimistic about the economic future for their country’s children. But just 44% of South Africans and 34% of Kenyans expect today’s children to be better off. South Africans ages 50 and older are particularly downbeat compared with those ages 18 to 29. In Latin America, majorities in Chile (69%) and Brazil (56%) expect today’s children to be better off financially. Chilean men are particularly optimistic. In Argentina people are divided on such economic prospects. And roughly half in Venezuela (51%) and six-in-ten in Colombia (59%) and Mexico (62%) believe kids will be worse off than their parents. As in their view of the current economy, the Turks and Israelis are generally upbeat about the future for today’s children. Half or more Turks (56%) and Israelis (50%) believe the youngest generation will be better off financially than their parents.